Contrary to profession’s view, evidence from clients suggests dishonesty in Scots solicitors is rewarded, not punished. SCOTTISH solicitors “make false representations in order to improve their client’s position, not necessarily their own”. This was a claim made by solicitor Alistair Cockburn, Chairman of the Scottish Solicitors Discipline Tribunal (SSDT) in response to key questions raised by BBC Journalist Sam Poling in the recent investigative programme Lawyers Behaving Badly. However, many clients who make complaints about dishonest solicitors will be surprised at the SSDT Chair’s claim, given the fact most complaints involving dishonesty encounter resistance on the part of the legal profession's self regulatory bodies such as the Law Society of Scotland and Scottish Legal Complaints Commission (SLCC). Solicitors sometimes make false representations – SSDT Chair Alistair Cockburn speaking to the BBC. The position on dishonesty taken by the SSDT boss appears to conflict with that found by many clients who are forced into the unenviable position of having to complain about their solicitor. After months of waiting on results from regulators run principally by lawyers, most clients who file complaints against their solicitors will be all too aware that regulators often refuse to even look at claims of dishonesty due to the fact a proven case of dishonesty against a solicitor may entitle clients to claim compensation from the Scottish Solicitors Guarantee Fund, and raise potential legal action in Scottish courts. More often than not, solicitors who are dishonest to their clients, and solicitors who regularly make dishonest representations – even before judges in a court of law, will not be struck off simply because regulators will ensure such cases never appear before the tribunal or see the light of day in a complaints decision found against a fellow solicitor by his colleagues in the profession’s own self regulator. Unsurprisingly, the Scottish tribunal’s view of claims of dishonesty by solicitors – a common theme in almost all complaints made by members of the public or clients against the legal profession in Scotland, contrasts sharply with the opinions of legal experts in the rest of the UK who insist dishonesty is a striking off offence. The BBC asked a panel of three legal experts from England & Wales for their opinion on the case of John G O’Donnell and how he was dealt with by the discipline tribunal which related to a case where O’Donnell was accused of borrowing £60K of clients money without consent. The panel easily concluded solicitors accused of dishonesty should be struck off as there was a risk to the reputation of the legal profession and the risk of reoffending was too great. Dishonesty in the legal profession: Risk factors mean it is a striking off offence – English legal experts. 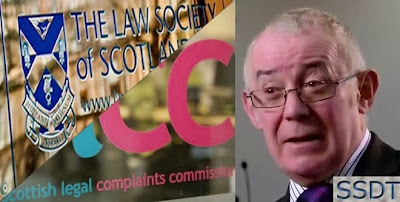 In Scotland every year and for well over two decades, there are and have been thousands of enquiries and complaints to the Scottish Legal Complaints Commission (SLCC) and the Law Society of Scotland. More often than not, as in the case of Borders solicitor Andrew Penman, who a Law Society reporter found in 1994 had deliberately deceived a bank, had attempted to put files in order with an implication of dishonesty while doing so, hardly any complaint against a Scottish solicitor which documents dishonesty on a grand scale, has ever resulted in a striking off. Mr Penman, who still works as a solicitor at Stormonth Darling solicitors in Kelso, was never struck off, and the Law Society along with its most senior staff set out to ensure any legal action against Mr Penman would never make it to court, the case and its history reported in detail HERE. Contrary to the Law Society’s claims during the 1990’s, the Penman case was not a blip. Evidence from hundreds of complaints since the 90’s show is more common than not for the dishonesty of a solicitor to be rewarded in the Scottish legal profession with a continuing practicing certificate, just as in the O’Donnell case and hundreds, potentially thousands of others, rather than result in a striking off. MSPs hear of little help for Scots Party Litigants in Supreme Court appeals. MEMBERS of the Scottish Parliament's Petitions Committee were told earlier this week that measures put in place by the Faculty of Advocates to help Party Litigants raise appeals in civil court cases to the UK Supreme Court – measures which require signatures from two counsel for a Party Litigant’s appeal to proceed, are mere “window dressing” and only serve to further obstruct or block access to justice for people who do not have legal representation. Kathie Mclean Toremar, who took her Petition 1504 to the Scottish Parliament’s Petitions Committee this week in a quest to obtain reform to the way in which the legal profession make life difficult for unrepresented party litigants to appeal against decisions taken in the Court of Session, detailed the difficulties faced by those who do not have expensive legal teams in place to represent their cases before Scotland's judiciary. The petitioner also revealed to MSPs that the average length of case for the majority of party litigants in Scotland is a shocking 11 years. 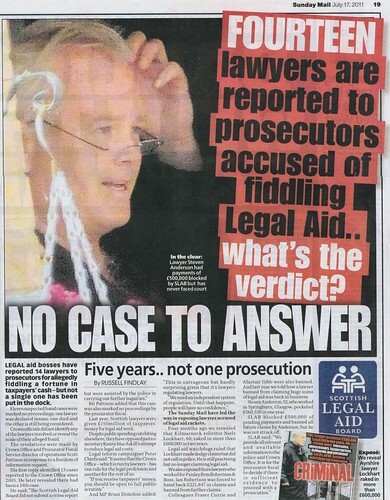 And it emerged in answers to further questions from MSPs that Scotland’s top judge Lord President Lord Brian Gill - famed for his own sharp criticism of the Civil Justice system and his Scottish Civil Courts Review can only manage to direct people with no legal representation or experience of the law to a web page, rather than provide help or answers to why no party litigant has ever been able to approach the Supreme Court after enduring lengthy, bruising encounters in front of Scotland’s highest court, the Court of Session. Prior to questions from MSPs in relation to the petition, the Petitions Committee Deputy Convener Chic Brodie criticised the way in which the Scots legal establishment fails to deliver information or help for those who need access to the courts. In response to questions from members of the Petitions Committee, Mrs Mclean Toremar also referred to a response from the Faculty of Advocates to the consultation on the Courts Reform (Scotland) Bill which is soon to be heard by the Scottish Parliament’s Justice Committee. In that response, the Faculty of Advocates said it found Party Litigants “Burdensome” and confirmed it was aware party litigants have difficulty with obtaining signatures from counsel. MSPs also heard evidence from the petitioner, that so far, not one party litigant from Scotland has ever been granted the right to appeal to the Supreme Court, so they cannot fulfil the criteria for making an appeal to the European Court of Human Rights. The Scottish Government have recognised there is an issue in how party litigants appeals are dealt with in Scotland and have included ‘some’ reforms in the forthcoming Courts Reform (Scotland) Bill. However the current proposals on offer from the Scottish Government do not go far enough and apparently do not even mention the phrase “party litigant” and in response to questions from David Stewart, the Convener of the Petitions Committee, Mrs Mclean Toremar said the proposals from the Scottish Government would not solve the problems raised in her petition. The Convener: The next item of business is consideration of one new petition, PE1504, by Kathie Mclean-Toremar, on party litigant civil appeals to the Supreme Court. As previously agreed by the committee, we will take evidence from the petitioner. Members have a note by the clerk, the Scottish Parliament information centre briefing and the petition. I welcome the petitioner and Gordon Mclean to the meeting. I invite Ms Mclean-Toremar to make a short presentation of approximately five minutes to set the context for the petition, after which I will start with some questions and then my colleagues will ask additional questions. Kathie Mclean-Toremar: Good morning, ladies and gentlemen. I hope that you understand that the petition is about not just me but a gross imbalance in the law regarding all persons in Scotland who find themselves being a party litigant—that is, someone who has to represent themselves in court. We are lucky enough to live in a democratic society in which that is possible. As I said in my petition, in “A guide to bringing a case to The Supreme Court”, paragraph 1.8, which is headed “Appeals from the Court of Session in Scotland”, states that, although “permission to appeal is not required from an interlocutor of the Inner House of the Court of Session”, the appeal “must be signed by two Scottish counsel”. That is where the flaw is. As we all know, a party litigant is a person who, for whatever reason, such as a lack of funds for a solicitor, represents themselves. Nowadays, people are more likely to represent themselves because of a lack of funding for solicitors from the Scottish Legal Aid Board. I myself have seen solicitors demonstrating about the issue. We will have a situation in which more and more people will be forced to represent themselves in court. When a party litigant represents themselves in the Court of Session, loses their case, then appeals and loses that appeal—I learned through a freedom of information request that there are no statistics on how many party litigants have won their case in the Court of Session—they are also then denied the right to appeal to the Supreme Court, which, according to the European Court of Human Rights, is deemed to be the highest court in the United Kingdom. On the Court’s website, which is www.echr.coe.int, frequently asked question 26 states that an individual must have taken their case to the highest court in the land before they can put it to the European Court of Human Rights. The fact is that people are being denied their human rights; in this case, the relevant article is article 6, on equality of arms. Everyone deserves a fair hearing. We should be on a level playing field, not divided between the have and have-nots in society. 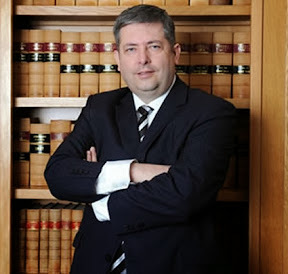 Party litigants lose their right to appeal because of paragraph 1.8, which states that two Scottish counsel must sign the appeal, while the experience of all party litigants is that they cannot approach Scottish counsel in their chambers or in the Court of Session, and certainly not at the advocates library. The only way to approach counsel is through a solicitor, which is where the even larger difficulty lies. The solicitor has only 42 days to read a case that might have been going on for many years. They then need to speak to two counsel and have them read the case, print their opinion and apply for an appeal to the Supreme Court. Although in theory that process can happen, in practice it cannot and does not happen. Legal aid has to be applied for, which takes time. If legal aid is granted, the solicitor can then contact counsel—I said “if” it is granted; the committee should please take into consideration the cuts to legal aid. The real problem is that solicitors are wary of taking on a case at such a late stage. As part of my research, I obtained a list of 38 solicitors via Law Society of Scotland recommendations. Having telephoned all 38 with the scenario I have just described, I found that not one of them was willing to take on such a Herculean task. The reasons cited by many of them included conflict of interests, lack of funding, too many hurdles, and, last but not least, the fact that the pursuer in the appeal has been a party litigant, in relation to which the legalities are a minefield that a solicitor would be reluctant to enter. It is not the solicitors’ fault; it is the fault of paragraph 1.8, which denies party litigants their rights. In paragraph 6 of its response to the consultation on the Courts Reform (Scotland) Bill, the Faculty of Advocates states that it knows that party litigants have difficulty with obtaining signatures from counsel. It goes on to say:“It has also become increasingly burdensome. The number of such cases has been increasing: between 2005 and 2010 the Faculty received five such requests from party litigants”. That is five requests in five years. “Burdensome” is defined as heavy, onerous, troublesome and hard to deal with, so we can deduce that the faculty does not think highly of party litigants I am still waiting for a response from the Faculty of Advocates to my freedom of information request about how many party litigants it has helped to appeal to the Supreme Court, but I have also contacted the Supreme Court and I already know the answer. Not one party litigant from Scotland has ever been granted the right to appeal to the Supreme Court, so they cannot fulfil the criteria for making an appeal to the European Court of Human Rights. Paragraph 1.8 denies a party litigant the right to appeal to the Supreme Court and to appeal to the European Court of Human Rights. That is a blatant human rights issue. The theory is there but, as I say, the practicalities deny a party litigant the right of appeal. Everyone must be treated equally, with fairness and respect. The current situation contradicts the Human Rights Act 1998 severely. This is a flaw in Scottish justice. The system that is in place is not fit for purpose. It places insurmountable barriers in the way of the party litigant. That happens in any civil case, and civil appeals show that party litigants have fewer rights. The Scottish Government has clearly recognised that there is a problem. Mr MacAskill mentions the issue in the Courts Reform (Scotland) Bill, but nowhere do the two words “party litigant” appear in the bill. I believe that my petition could serve to support any further planned measures to bring relief in such cases, so I feel that it is in the interests of justice and of all party litigants for the committee to consider it. The Convener: Thank you very much. If Mr Mclean would like to respond to any of the questions that we ask, I encourage him to catch my eye.You have probably dealt with my first question, but I will ask it anyway, just for the record. You mentioned the two-counsel rule, which seems to be crucial. Are you arguing that article 6 of the European convention on human rights, which is on the right to a fair hearing, is being breached? Kathie Mclean-Toremar: I am saying that a party litigant does not have the right to approach counsel. That is a breach of equality of arms, for which article 6 provides, so people’s human rights are being breached. A party litigant cannot approach counsel directly—they must go through a solicitor. The Convener: My second question is about future legislation. You mentioned the Government’s Courts Reform (Scotland) Bill, which will be considered by the Justice Committee, and you hinted at what it could do. My understanding is that that bill will take away the two-counsel rule and that it will be for the inner house to decide whether there are sufficient grounds for someone to go to the Supreme Court. What is your view of that assessment? If the bill went through, would it solve your problem? Kathie Mclean-Toremar: No, it would not. The bill, which I believe was introduced on 6 February, does not mention party litigants, and I think that that is a gross problem. The phrase “party litigant” does not appear in the bill. Will the bill provide a big umbrella, under which everyone will fit, or will it provide for people who are legally represented? That is where the problem lies. If someone is not legally represented, how will they be able to go to the inner house, which is what it is proposed will happen? The Convener: So you are arguing that the bill would not solve your problem. Kathie Mclean-Toremar: It would not cover party litigants. The Convener: Okay—thank you for that. Chic Brodie: I will begin with a general point, which does not relate only to the Public Petitions Committee. 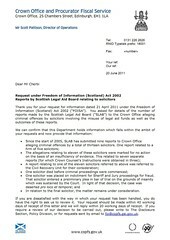 I am very concerned about how hard it is to get information out of the legal system in Scotland. Given that a number of approaches have been made and that hardly any replies have been received, I wonder what on earth is going on and how our legal system is being administered. People should at least have the decency to provide a reply, whether we are talking about the Lord President, the cabinet secretary or whoever. I leave that point lying. What is your view of the proposed change, whereby someone would be able to approach the Faculty of Advocates, rather than having to have two solicitors approve their appeal to the inner house? Kathie Mclean-Toremar: At the moment, a party litigant has to get two signatures from Scottish counsel. That is where the problem lies. It is not possible to approach counsel, to go to the Court of Session to speak to counsel or to phone up counsel. They will have nothing whatever to do with you. It is necessary to go to a solicitor, who will go on your behalf to counsel. Kathie Mclean-Toremar: Yes, that is another problem. Chic Brodie: Where is the evidence for that? Kathie Mclean-Toremar: I believe that a solicitor from Glasgow submitted a petition a few months ago on the problem whereby a Glasgow solicitor has to instruct an Edinburgh solicitor in order to be able to go to the Court of Session. That is my understanding—that is the way in which the situation was explained to me. I went to a Glasgow solicitor who told me that. A solicitor cannot do that unless they have what I think is called the right of audience. Chic Brodie: If that is the case, I find it most disconcerting. I have one last question. I know that we cannot go into the detail of your case, but do you agree that there has to be some filtering out of the number of cases in which the inner house might be approached, other than through the two solicitor rule? Have you any idea how that process might be performed? Kathie Mclean-Toremar: We do not know how long it will take for the Courts Reform (Scotland) Bill to go through. It could be changed so that a party litigant who had gone through the Court of Session, appealed and lost their appeal would have the right to go directly to counsel. It might be argued that there is already a free legal services unit. You can go to various agencies and ask them to make an application to the FLSU, which is run by certain advocates on a pro bono basis, but the unit can give people only three days. Many cases have taken years to go through the Court of Session, so three days is not enough. It takes more than three days to read the case and do research. The FLSU does not cover a party litigant in that regard. Angus MacDonald: I appreciate your bringing these anomalies to the Parliament’s attention. It seems unfair that party litigants can approach counsel only through a solicitor, which defeats the purpose of the individual having the right to represent themselves. I agree with you that the 42-day period for filing a notice of appeal seems excessively short. You did not really touch on that in your preamble. It has been noted that the Courts Reform (Scotland) Bill seeks to introduce a provision that requires litigants to seek leave to appeal, rather than there being a requirement for two counsel to certify appeals. I understand that, in the bill, there is no intention to increase the 42-day period for filing a notice of appeal, although I could be wrong. Clearly you would wish that period to be increased. Kathie Mclean-Toremar: Yes, if possible. The Convener: As you probably know, we get a briefing from our information service—SPICe—on every single petition that is lodged. Our briefing states:“the Faculty of Advocates suggests that party litigants can approach the Faculty directly for assistance in this regard.”Do you have any comments on that? Kathie Mclean-Toremar: I have tried—and I know of three other party litigants who have tried—to address the Faculty of Advocates. The faculty does not reply.I sent a freedom of information request on the matter eight weeks ago, but I have not had a reply. As it says in its response to the Government consultation, the Faculty of Advocates finds party litigants “burdensome”. That is shocking. That means that we are not on a level playing field where everyone has the right to represent themselves. The system does not work. The Convener: Is it reasonable to say that there is an outstanding issue around the Faculty of Advocates? We have picked up that it is offering to provide help and advice, but you are saying that you have found it difficult to get a response. Kathie Mclean-Toremar: It does not respond. That is where the free legal services unit comes in, which the Faculty of Advocates runs on a pro bono basis. The problem is that you have to find an agency, which could be Strathclyde law clinic or a citizens advice bureau, to make the application to the free legal services unit at the advocates library, and somebody will read it and say yes or no. However, as you can have only three days from the unit, and they take perhaps one day to read it and one day to do a bit of research, when will they stand in court and do the proof? There is no time. I hate to say this, but I feel that the Faculty of Advocates is just doing some window dressing and not addressing the problem. It does not respond to freedom of information requests. I made an FOI request to the Supreme Court in London, which told me that not one party litigant from Scotland has ever been able to appeal. Why? The Convener: I am not putting words in the mouth of our information service, but the general comments that we get through it are that the two advocates or counsel that you refer to will not sign an appeal unless they feel that there is a valid issue in law for the case to go to the next stage. That is the general legal position. Do you accept that that summarises where we are in the law? Kathie Mclean-Toremar: Yes. The average length of case for the majority of party litigants is 11 years. I think that they have a point in law; otherwise, they would not have kept going for more than 11 years and their cases would have been thrown out of court. It is up to the party litigant to put forward the points of law to the advocate, which is not done lightly. However, they are not paying for the advocate or counsel, and I think that money really speaks. The Convener: Mr McLean, do you have anything to add at this point? Kathie Mclean-Toremar: Might I add something? Kathie Mclean-Toremar: I approached Lord Gill, but he simply sent a letter from his secretary telling me to go www.supremecourt.com. I did not ask for legal advice and I did not ask any unusual questions. I just asked about paragraph 1.8, but he would not answer me. Everybody whom I have asked in the legal system has told me to go to paragraph 1.8. The Convener: Thank you for that. We have come to the end of questions, but we want you to stay while we look at how to deal with your petition. You have raised a lot of very interesting points and shown that there is real frustration among party litigants, particularly about getting to the Supreme Court and using ECHR. Normally, the committee wants to go as far as we can with each petition. There are some exceptions, however, such as where another committee is looking at legislation that is relevant to the petition. As you will know, the Justice Committee is looking at the Courts Reform (Scotland) Bill. It would therefore make a lot of sense for us to refer the petition to that committee so that it can consider whether the bill could help you. My advice to the committee is that we refer the petition as soon as possible to the Justice Committee so that, as part of its consideration of the bill, it can look at the issues raised by the petitioner. I think that the petition raises quite a lot of questions, and I would be pleased if our colleagues in the Justice Committee could have a look at it. However, that is a matter for committee members to decide. What are members’ views? Chic Brodie: I agree with your view. However, sometimes we forget why we are here, which is to respond to people who have genuine issues. I fail to understand why the powers that be are not responding, at least with some degree of courtesy, to the petitioner. Personally, I find it wholly unacceptable that information is not being provided—there is not even the courtesy of a letter. I hope that the message that we send from here, whether formally or not, is that we are here to represent petitioners, whether they are right or wrong, and that they should be treated with courtesy, no matter what part of Government is involved. Frankly, in my opinion, some of the answers—indeed, the lack of answers—that have been received in this case are wholly unacceptable. The Convener: Mr Brodie makes an excellent point. Do members agree with the recommendation that we refer the petition to the Justice Committee? Members indicated agreement. The Convener: As the petitioners will have heard, we are keen to ensure that the committee focusing on the bill also focuses on your petition. We will therefore arrange for it to be transferred immediately to the Justice Committee, which will keep you up to date with progress. The petition is still active in the Scottish Parliament; it is simply being referred to the appropriate committee that is considering the legislation. Kathie Mclean-Toremar: When I went to my local MSP, Michael Russell, he informed me that he had spoken to Kenny MacAskill, who said that the law will be changed when Scotland gets independence. Kathie Mclean-Toremar: I just wanted to put that on the record. Jackson Carlaw: I am sorry, convener, but I must ask the witness whether that comment was communicated to her in writing. Jackson Carlaw: But do you have written confirmation of it? Jackson Carlaw: It would be very interesting if you were able to obtain that commitment in writing and shared it with the committee. The Convener: Thank you, Mr Carlaw. As I have said, the petition is still active and will be referred to our colleagues on the Justice Committee, who will consider it alongside the bill.I thank the petitioners for coming along and raising a number of very worrying points. I hope that the Justice Committee will be able to look at the matter in more detail.I suspend the meeting for a minute to allow our witnesses to leave. Kathie Mclean-Toremar: Thank you very much for listening to us. The Committee agreed to refer the petition, under Rule 15.6.2, to the Justice Committee as part of its scrutiny of the Courts Reform (Scotland) Bill. Increasing numbers of legal aid fraud cases ‘under consideration by Lord Advocate’s prosecutors. FOLLOWING last week’s conviction of Advocate Mark Strachan for actual and attempted fraud against the Legal Aid fund of £49,545 at Edinburgh Sheriff Court after a 10 day jury trial, it has emerged that Scotland’s Crown Office & Procurator Fiscal Service (COPFS) has a further fourteen cases “under consideration” involving additional allegations of legal aid fraud against both members of the public and the legal profession. Information obtained from the Crown Office under Freedom of Information legislation has revealed that in 2012, one case of legal aid fraud received a “direct measure” fine, while another went to prosecution, ending up in the accused being found guilty and sentenced to a community payback order. A further five reports of cases involving legal aid fraud allegations were indicated as being “under consideration”. In 2013, one case of legal aid fraud reported to prosecutors was marked “no proceedings”, the Crown Office claiming this was due to “insufficient evidence”. Another case of alleged legal aid fraud received a “direct measure”, with a further twelve cases being marked as “under consideration”. Crown Office refused to release details on legal aid fraud lawyers. 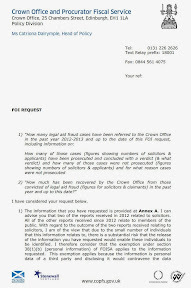 However, while the Crown Office was content to supply information relation to cases of legal aid fraud involving members of the public, COPFS refused to supply information on two cases involving legal aid fraud allegations against solicitors, citing fears that if information was provided it may lead to the identity of the solicitors who were accused of dodgy legal aid claims. The Crown Office supplied no information on how much publicly funded legal aid money was alleged to be involved in any of the cases of alleged legal aid fraud reported to prosecutors. A jury at the Sheriff Court in Edinburgh has found Mark Strachan, Advocate, guilty of actual and attempted fraud against the Legal Aid fund of £49,545. During the ten day trial, Strachan (55) had denied falsely claiming travel allowances and mileage fees on 341 instances between March 2006 and November 2010. In evidence, the court heard that Strachan had homes in Aberdeenshire, West Lothian and Edinburgh and that when he was in Aberdeen on business, he would sometimes see a number of people on the same day. He then charged the board the full fee of £100 travel allowance and £108.80 mileage for a 272-mile return journey to the central belt, at 40p a mile, for each person he saw. However, legal aid rules indicate he was entitled to claim only one travel and mileage allowance. The Crown heard that Strachan was not making the return journey to Linlithgow or Edinburgh every trip, as he claimed, but was staying with his wife, Elaine, at their home in Old Leslie, 30 miles from Aberdeen. Despite denials by Strachan and his wife, Strachan was convicted of actual and attempted fraud for the mileage claims. Strachan's defence counsel, Brian McConnachie QC, had told the jury his client was no longer practising as an advocate, but was studying for a degree in oil and gas law at Aberdeen University. Meanwhile the Fiscal Depute, Keith O'Mahony, told Sheriff Kenneth Maciver that Strachan had no previous convictions. The court also heard from the Fiscal Depute that the Faculty of Advocates' financial section had repaid £4,509, but nothing more had been received by the board since September 2011. The Prosecutor also indicated to the court the Crown was seeking a confiscation order under the Proceeds of Crime Act. Deferring sentence until 14 March for reports, Sheriff Maciver told Strachan it had been a serious and significant fraud, adding "The court has to consider not only the scale and nature of the crime, but also the issue of a breach of trust, because as an advocate you are in a special position". The sheriff went onto warn Strachan: "You must prepare yourself for the possibility the court may require custody." MSPs have been debating transparency call for declarations of all judicial interests. MEMBERS of the Scottish Parliament’s Public Petitions Committee have been hearing evidence and debating the merits of Petition PE1458: Register of Interests for members of Scotland's judiciary, a public petition calling for all members of Scotland’s judiciary to be subject to a full and publicly available register of judicial interests. The proposal envisages creating a single independently regulated publicly available source containing current information on judges backgrounds, their positions on personal wealth, so-far undeclared earnings, business & family connections inside & outside of the legal profession, offshore investments, hospitality, details on recusals and other information which is routinely lodged in registers of interest across all walks of public life in the UK and around the world. 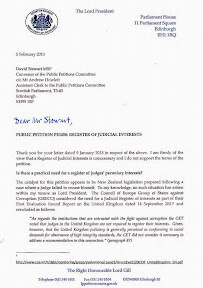 Petition PE1458 has so far recorded six debates at the Scottish Parliament’s Public Petitions Committee, one deferral (on account of the earlier postponed meeting with the Lord President last November), and three strongly worded letters from Lord President Lord Brian Gill who continues to protest against the call for greater transparency of judges undeclared interests. 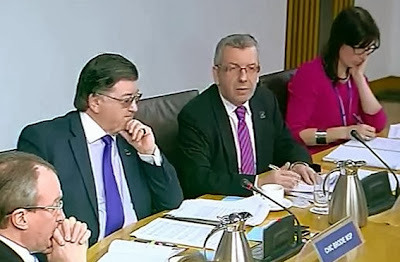 The Lord President has twice refused to show up at the Scottish Parliament to answer questions from MSPs on how the current system of oaths and rules regarding recusals operates. In refusing to attend the Petitions Committee in public, Lord Gill has also avoided any questions to justify the strength of his opposition to the transparency proposal. The petition has also received submissions from other interests in the legal system including the Law Society of Scotland, the Crown Office, the Scottish Court Service, the Scottish Government, the Judicial Appointments Board, the Judicial Complaints Reviewer and a Member of the New Zealand Parliament who is also involved in creating a register of interests for judicial figures in New Zealand. The petition has also received submissions from individuals who have had their lives seriously impacted by the lack of judicial transparency including now widely reported failures of judges failing to recuse themselves and failures to declare interests. Petition PE1458, which has been opposed by the vested interests of the judiciary itself and other anti-transparency figures in the justice system, is due to be heard again at the Petitions Committee after a fourth letter from Scotland’s top judge is received by the Public Petitions Committee. However, three weeks on from the private meeting between msps, Lord Gill and the Director of the Judicial Office, no such letter from the Lord President has been made publicly available. 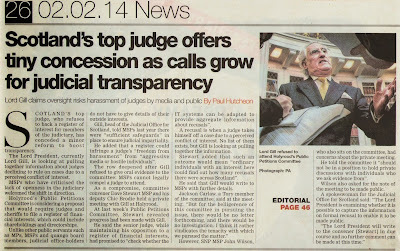 Top judge set on fighting msps over judicial transparency register proposal. NOTES of a private meeting between Lord Gill and two msps from the Scottish Parliament’s Public Petitions Committee have now been published, leaving little doubt Scotland’s top judge Lord President Lord Brian Gill is set on fighting any move by Holyrood to bring in a major reform in transparency for Scotland’s judges by creating a register of judicial interests as called for Petition PE1458: Register of Interests for members of Scotland's judiciary. 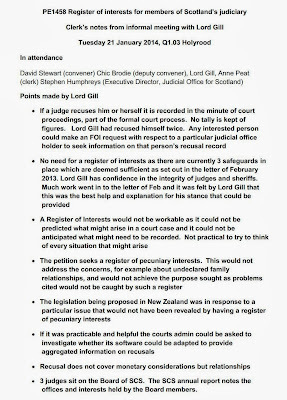 The notes of points made by Lord Gill, taken by Anne Peat, Clerk to the Public Petitions Committee, reveal the top judge continues to insist there is no need for a register of interests for the judiciary. Lord Gill claimed that judges are exempt from transparency because they are bound by oaths written by themselves, that judges do recuse themselves and notes are recorded of this, and that if the public wanted to find out about recusals, they could use Freedom of Information legislation. At the private meeting, the clerk’s notes indicate Lord Gill went on to claim a register of interest is “not workable” as judges have so many interests it would not be possible for them to identify what should be declared or be withheld from public gaze. However, the “unworkable” myth spun by the top judge at the private meeting has apparently not prevented thousands of other registers of interest operating smoothly in public life both at home and abroad. The top judge also claimed “Much work” went into a letter of February 2013 in which the Lord President set out his position on the transparency reforms. However, in this same letter, Lord Gill accused the media of being “aggressive”, branded litigants & court users as “hostile”, claimed judges privacy would be breached if their interests became a matter of public debate and warned that such an application of transparency may make it more difficult to recruit judges in the future. If a judge recuses him or herself it is recorded in the minute of court proceedings, part of the formal court process. No tally is kept of figures. Lord Gill had recused himself twice. Any interested person could make an FOI request with respect to a particular judicial office holder to seek information on that person’s recusal record. No need for a register of interests as there are currently 3 safeguards in place which are deemed sufficient as set out in the letter of February 2013. 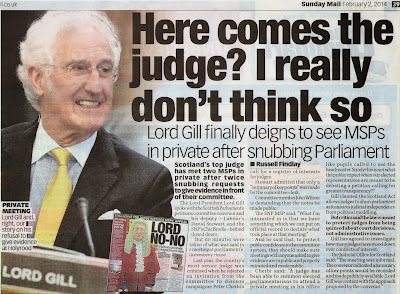 Lord Gill has confidence in the integrity of judges and sheriffs. Much work went in to the letter of Feb and it was felt by Lord Gill that this was the best help and explanation for his stance that could be provided. A Register of Interests would not be workable as it could not be predicted what might arise in a court case and it could not be anticipated what might need to be recorded. Not practical to try to think of every situation that might arise. The petition seeks a register of pecuniary interests. This would not address the concerns, for example about undeclared family relationships, and would not achieve the purpose sought as problems cited would not be caught by such a register. The legislation being proposed in New Zealand was in response to a particular issue that would not have been revealed by having a register of pecuniary interests. If it was practicable and helpful the courts admin could be asked to investigate whether its software could be adapted to provide aggregated information on recusals. Recusal does not cover monetary considerations but relationships. 3 judges sit on the Board of SCS. The SCS annual report notes the offices and interests held by the Board members. The notes, as published above appear to have added little to the debate about a judicial interests register taking place at the Scottish Parliament’s Petitions Committee, where it is hoped to hear the petition again sometime in the coming weeks. 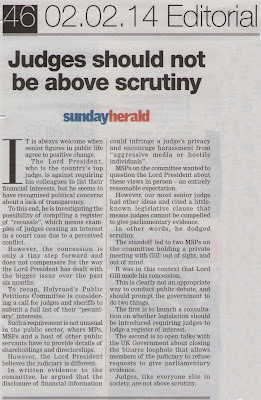 Also, it was revealed earlier last week by the Judicial Office and prior to the parliament’s publication of the meeting notes, that Stephen Humphreys, the Executive Director of the Judiciary of Scotland attended what was supposedly a private informal meeting in an official role to support the Lord President. Victorian and late, Civil Courts reform will change little in Scots justice system. SEVEN YEARS after Lord President Lord Brian Gill (then Lord Justice Clerk) was commissioned in 2007 to study Scotland's expensive closed shop civil justice system which culminated in the unremarkable 2009 Civil Courts Review conclusion that ‘things had to change’, the Scottish Government have today finally announced plans to bring the Courts Reform (Scotland) Bill to the Scottish Parliament for consideration by MSPs later this year. The much heralded Gill Civil Courts Review published in 2009 which can be viewed online here : Scottish Civil Courts Review Synopsis, Scottish Civil Courts Review Vol1 Chapters 1-9 & Scottish Civil Courts Review Vol2 Chapters 10-15 has so far impacted little on how Scots are able to access justice in the Scottish courts. At the time, Lord Gill branded Scotland’s civil justice as “Victorian” and “failing society”. Little has changed from those criticisms some seven years on. 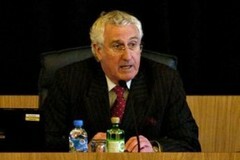 However, many of the reforms proposed by Lord Gill in 2009 which could have helped the man on the street gain a hearing in court have unsurprisingly been opposed by the legal profession and solicitors who are concerned they will lose their long held almost exclusive rights of audience and ability to charge whatever they want for legal services. Published today, in what is clear an attempt to take the sting of the embarrassment suffered by Justice Secretary who yesterday lost his battle to the long held safeguard of corroboration of evidence from the criminal justice system, the Scottish Government have heralded a number of changes which are claimed as a substantial improvement on what is currently nothing short of a money spinning closed shop Civil justice business model for the legal profession, and the judiciary. The Scottish Government claims the Courts Reform (Scotland) Bill implements many of the recommendations of the Scottish Civil Courts Review, led by principal reviewer Lord Gill and commissioned in 2007. Lord Gill recommended substantial changes to modernise and improve the structure and operation of the courts, which he described in the review as ‘slow, inefficient and expensive’. • Increasing the threshold under which the sheriff court can deal with civil cases from £5,000 to £150,000 - freeing up the Court of Session to deal with the most challenging civil disputes. This is expected to strengthen the role of the sheriff court, while reducing costs and delays for litigants. • Creation of a new national personal injury sheriff court, where such cases will be heard by specialist sheriffs. • Creation of a national Sheriff Appeal Court to deal with summary criminal appeals from sheriff and justice of the peace courts, and civil appeals from sheriff courts. This will help avoid the need for some civil appeals to be heard in the Court of Session and some criminal appeals in the High Court, delivering more proportionate costs, while preserving the right to appeal to the higher courts. • Creation of a new judicial post – the summary sheriff - to resolve lower value civil cases such as debt cases more swiftly and efficiently, while also dealing with summary criminal cases. • Plans for specialist sheriffs and specialist summary sheriffs in areas of law such as family, housing, personal injury and commercial law, with the expertise to deal with these issues as swiftly as possible. • New procedures for judicial review cases in the Court of Session including a three month time limit, and new procedures for appeals within the Court of Session and some appeals to the UK Supreme Court to improve efficiency. Justice Secretary Kenny MacAskill said: “As highlighted by Lord Gill, our civil justice courts have remained relatively unchanged for more than a generation and need to be made more effective and efficient. This bill takes forward our commitment to ensure that Scotland’s civil justice system becomes more accessible, affordable and efficient for those people who need to resolve civil disputes. He continued: “At present many lower value personal injury cases are raised in the Court of Session costing the parties a disproportionate amount and clogging up the court. In future, most of these cases will be able to be raised in the specialist personal injury court with specialist sheriffs and procedures designed to achieve settlement swiftly and at a proportionate cost to the parties. The sheriff courts are well placed to handle this transfer as the total cases coming out of the Court of Session is only around three per cent of the civil caseload in the sheriff courts. Which? Executive Director Richard Lloyd said: "Getting the courts working better for people must mean cases being dealt with quickly and cost-effectively. Which? supports the plans under the Courts Reform Bill to move business below the value of £150,000 in to the Sheriff Courts as this will mean more consumers will be able to seek redress for poor services or faulty goods. That will be good for consumers and good for the many businesses that play fair with their customers." The Scottish Government did not provide any supportive comments directly from litigants who have found it difficult to gain hearings in court, however Diary of Injustice can. Commenting on the Scottish Government’s civil justice reform proposals, a personal litigant who has recently been charged tens of thousands of pounds for incomplete transcripts of court hearings before Scotland’s senior judges claimed the reforms do not go far enough. Speaking to Diary of Injustice today, a legal insider claimed the Civil Courts reforms will not serve to improve the image of Scotland’s expensive yet poor quality justice system at home or abroad. The Lord Justice Clerk, now Lord President, Lord Gill, author of the Civil Courts Review. The Lord Justice Clerk, Lord Gill, in his speech to the Law Society of Scotland’s 60 year anniversary conference several years ago, reproduced in full here said : “The civil justice system in Scotland is a Victorian model that had survived by means of periodic piecemeal reforms. But in substance its structure and procedures are those of a century and a half ago. It is failing the litigant and it is failing society. Labels: civil courts review, civil justice, Courts Reform (Scotland) Bill, Kenny Macaskill, Lord Gill, Scottish Government, Scottish Parliament, Which?